LED chasers are the Hello World of microcontrollers. Here’s mine for the TI Launchpad. Download source and Makefile here. 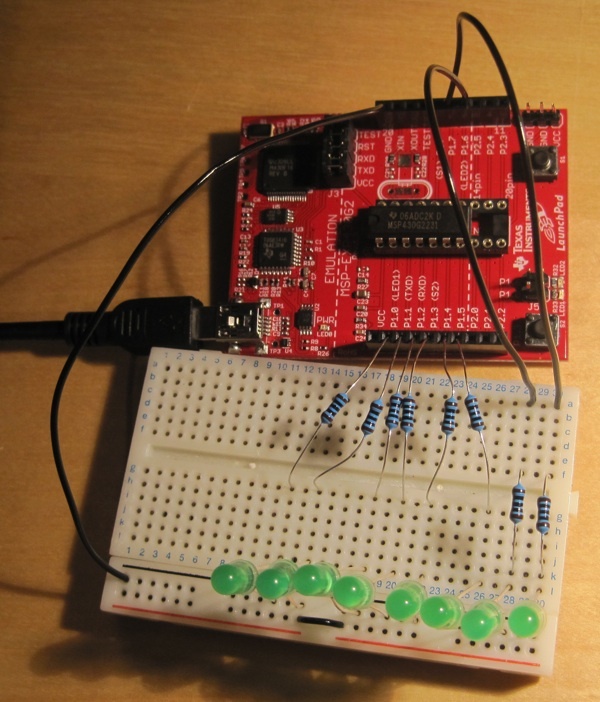 The MSP430G2231 doesn’t have enough timers or hardware Pulse Width Modulation channels for a good chaser effect. I want brightness control of 8 independent channels. My solution is to use a single timer and Binary Code Modulation. BCM uses less processor time than PWM but doesn’t provide a single on and a single off period per cycle. Instead, it uses several bursts. This is fine for LEDs, where given a fast enough period the human eye can’t tell. The reason for BCM’s efficiency is that the on/off periods are directly related to the binary representation of the desired duty cycle. Here’s a great tutorial. LEDs really need a diffuser. I’m using an opaque plastic bowl. The circuit is simple. 8 LEDs to P1 (via resistors).